Having very high ceilings calls for a larger profile crown molding. 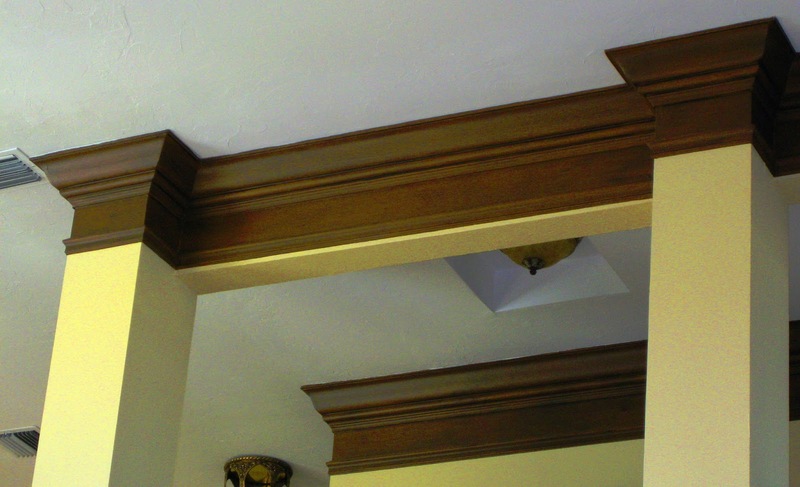 Here is a great trick to achieve the look of larger crown molding and save money, two moldings were used with the trim molding applied 4 inches below the crown. 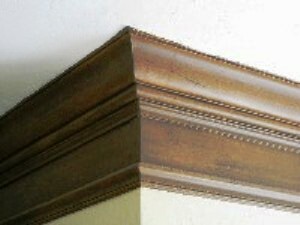 The crown molding size increased from 5 1/4 in. to around 12 inches. 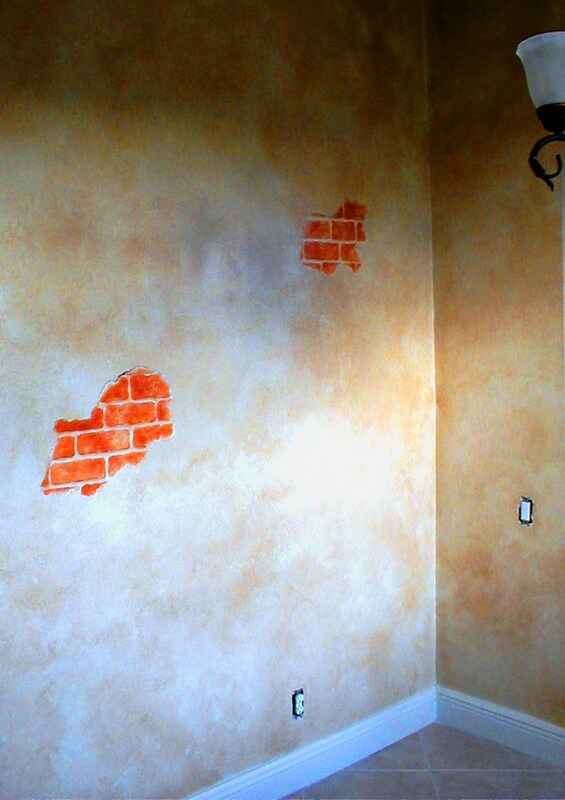 The wall area was base coated and faux painted to give the illusion of one large molding. The space below the crown molding needs to have a smooth finish for the faux wood technique. The sheet rock area which is in the center of the two moldings may need to be skim coated with compound, to remove any texture which was produced by a past paint finish. Once the compound has dried and smoothed out clean all dust with a damp cloth. Apply a primer, let dry completely and apply the base coat to all pieces which make up this new extended crown. Note: all brush strokes most go with the grain direction from start to finish. That means the primer too. 1st glaze - BM - Charleston Brown - 1 part paint to 3 parts glaze, this glaze will be brushed on randomly applying heavier in some areas and lighter in others. I recommend this to give the look off real wood. Your brush strokes need to go left to right lot form a grain pattern. Note: A quart of paint goes a long way especially when glaze is added. 2nd glaze - BM - # 2107 - 10 - 1 part paint to 3 parts glaze, this glaze will be applied lighter than the first keeping in mind of a flowing grain pattern. Step 3 - This faux wood shown above has the look of deep scratches and some of the scratched areas are moving diagonally across the grain. With a 1 to 2 in brush apply the scratched areas with a dry brush and use straight paint ( no glaze ). If the lines come to heavy wipe them off with a damp rag and try using a lighter touch. Note: Adding worm holes with an artist brush gives more realism to your work. Last step - I use this step to give a believable glow to the faux wood. Over time the poly will age and amber. Brush on satin polyurethane with a 2 1/2 inch china bristle brush, move with the grain. Add a small amount of poly to your brush so it does not sag or run on your hard work. before you tackle the real thing. This is a great finish if your looking to add an old world affect to your decor. Painted distressed stripes can be applied to doors, walls or accent areas. This technique resembles old wooden boards and is filled with character. Basically anything goes to produce this look, the lines of these stripes are not perfect, there meant to be irregular. Several earth tone colors were used in an alternating pattern of lighter stripes and then darker. The stripe pattern seems to be normal at first and then the fun begins. Applying opposite tones of color to each stripe with a dry brush creates a wood grain with an erratic design, just perfect for a distressed look. Now, you could get carried away with this project so keep from going over board, no pun intended. Wow! Add a red textured ceiling with gold crown molding and you get a powerful combination that equals one thing, Opulence! This ceiling is located in the dining area which co ordinates wonderfully with the surrounding furnishings. The room is warm and inviting with an old world touch. Red a color of strength and passion also is known to enhance conversation and appetite, the dining room is just the right place for this color. Hand painted gold crown moldings adds the sparkle of jewelery to enhance the dining experience. The textured ceiling was lightly textured with a 6 in. blade and compound, primed and then base coated with a light tan latex eggshell finish. A sea sponge was used to apply the red glaze which was allowed to build up in the texture and also create a mottled affect. The crown was base coated with a tan color and then coated with gold latex metallic finish. When the gold paint was dry a chocolate brown glaze was applied to enhance the design and leave an old world patina. Can't wait to see whats on the menu, bon appetit! 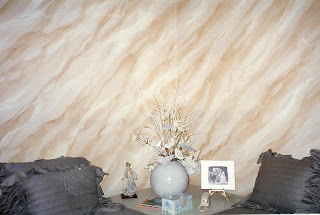 Faux painted marble can be used in many areas of your home. Boarders of painted faux marble in your bath room are a great way to enhance the architectural lines. Applying this finish to fireplace surrounds, table tops and accent walls will create an air of sophistication at a fraction of the cost of real marble. Follow the steps below and please practice this technique until your comfortable with your results. Examine real marble, this will be time well spent. Latex paint was used to produce this faux marble shown above. The base coat a blackish green was applied with a muslin roller with a low nap. A dark green glaze is applied randomly with a sponge . 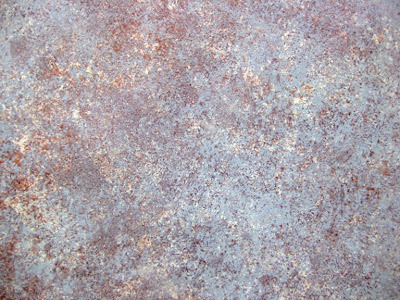 Blend this glaze threw out the surface without it becoming a solid color, leave breaks in the finish. Allow the base coat to come threw while sponging. Keep in mind that each application of paint or glaze needs to have its own shape and size to keep it from forming a pattern. Before this coat dries apply a lighter green glaze randomly and sponge in to create a 45 degree flow which most marble have. Let this dry before adding the off white. I use an artist angled brush to apply the floating drifts of minerals which you would find in marble. The drifts should be applied over an area of water lightly applied to the surface. Now, you can add color to accent areas of your marble to create a more realistic piece. I use artist acrylic paint to add accent color glazes to add interest. Use a cotton swab to move the glaze around and or remove glaze as needed. Veining is not necessary for this project. When all is completely dry apply a couple coats of gloss urethane. Gloss urethane will produce the look of polished marble and become more believable. 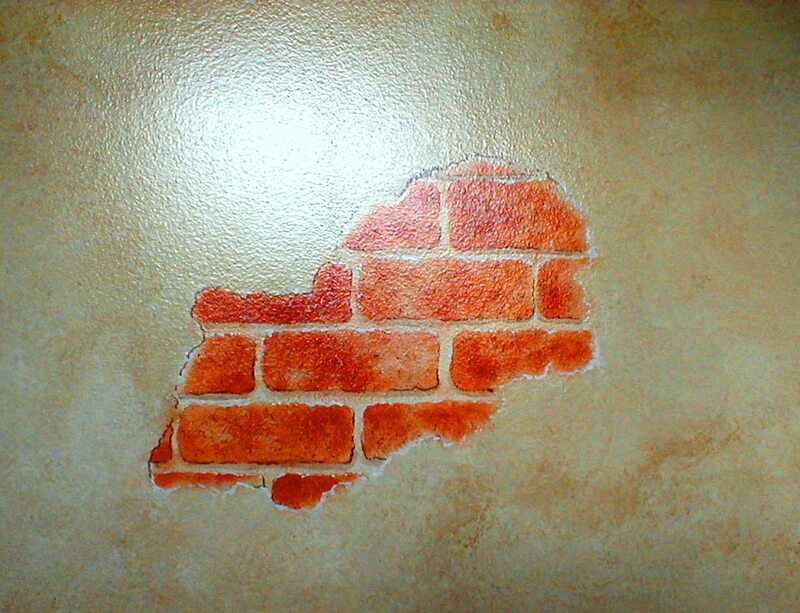 Sponge painting techniques allows endless variety for you to create amazing surfaces. 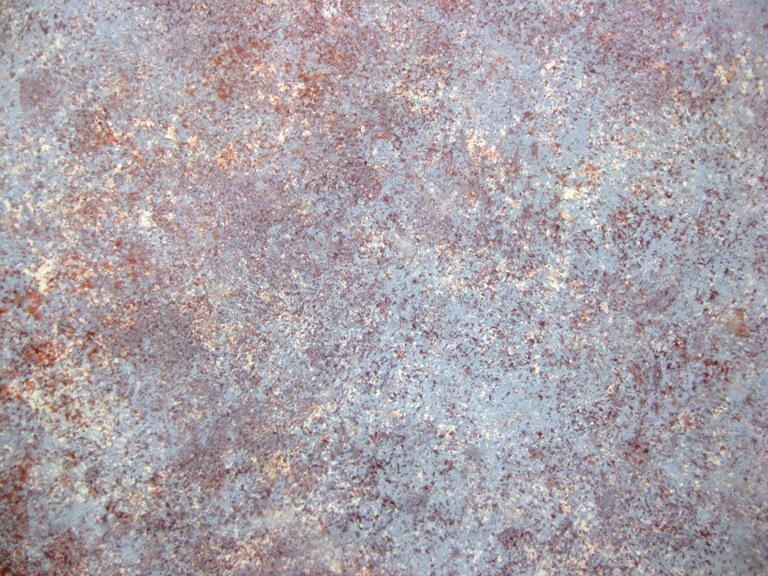 The sample shown above was done using a "Positive" technique where the paint is added directly to the surface by a sea sponge. No glaze was used for this sample. The sea sponge needs to have many spiked areas to produce this dotted look. I chose analogous colors so there was harmony and color blending would produce beautiful overlays. Each layer of color was allowed to dry before applying the next color. I call this technique Fantasy Granite. Explore all the amazing things you can do with paint! Painted gold metallic crown molding is such an elegant and rich compliment for any ceiling that needs a touch of sophistication. Gold metallic paint comes in many hues and emulates gold leaf. These molding are made of foam with a sturdy shell which can be painted. There are countless designs and sizes. Try to paint the moldings before they are applied to the ceilings, its much easier. I start off applying a golden tan tinted latex primer and then apply a golden tan latex base coat. Once the base has dried fully I apply two coats of metallic gold latex with a brush. Then I apply a chocolate glaze with a brush and wipe off the excess with a cotton rag. The glaze dries and it leaves a beautiful aged patina. Looking up has never been better! Yes! You can have wood kitchen cabinets, at least faux wood finish kitchen cabinets that look like beautiful wood. Here are before and after photos of the same kitchen. The old cabinets below have a white washed finish that needs to be updated, they seem to blend into the walls and floor. Above photo, now the faux painted cabinets pop! They are warm and inviting. The pantry door was also faux painted to match. Moldings were added to the center island and then faux painted. A satin polyurethane finish was applied to give more warmth to the finish and durability. When the cost for new cabinets is not in your budget this may be the way to go, paint them. Wavy diagonal stripes add a little whimsey to a room and adds character. This is a hand painted design that's easy and fun. We chose the two walls by the day beds as a focal point. Three colors were used for this rag technique. First apply the base coat in an eggshell finish, I suggest two coats for the base, which is a med tone color. Once the base is dry apply the first glaze which is lightest color. The next glaze is the darker color. Choose colors which are in the same family and are a few shades darker from one another, so you have some contrast. The glaze formula for both colors are 1 part paint to 1 part glaze. Once the base coat has dried the first glaze is applied with a soft rag. The rag is painted with glaze and transferred to the walls using a 45 degree angle. TIP: Put a small amount of glaze into a paint tray and brush the glaze onto both sides of the rag. Rap the painted rag around your fingers and draw the design on the wall producing a wavy pattern. Wear gloves so your hands stay clean from any paint. Apply the second glaze the same way but run the glaze in and out of the last glaze pattern. 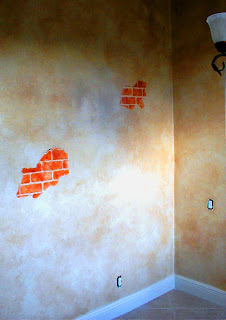 While the glaze is wet on the wall removing excess glaze is easy. Try to keep the pattern random. The diagonal stripes look best when there are various shades of a color popping up randomly. TIP: Try not to have a solid stripe, remove glaze in some spots and leave straight glaze in others. This will produce an interesting pattern. form of painting that can be a lot of fun. This technique will find the artist in you, enjoy! Coffered ceilings add a unique and elegant look to any room. Here is an example of how this type of ceiling can be decorated with paint. The ceiling panels were sponge painted with a subtle warm glaze and the crown moldings were fauxed to a warm mahogany with a satin finish. The soft off white painted beams have a great contrast with its neighboring colors making this ceiling pop.